It seems like when August rolls around, people start looking for something new to do with all that zucchini that you either have in your own garden or found at the fresh market. I’ve got a one pan dish that is easy to construct with the best part being you can do the entire recipe on your LP/Gas grill. Grab your prized zucchini and get to the grill and I’ll show you how easy this technique and recipe are for a great meal. Preparing the zucchini is very simple for this recipe as we want all the nutritional value of the skin as well. After washing, patting dry, and trimming off the ends, cut 1-inch thick rounds and then cut each round into smaller pieces. For the smaller rounds, you should get 4 pieces and the larger 9. Place all the cut zucchini pieces into a disposable foil pan. There’s no need to spray the pan or add any liquid as zucchini has a 95% water content and when cooked, produces 6 oz. of water per every cup. This will naturally steam away while in our grill pan while tenderizing the zucchini for our dish. Plus, the high-water level will attract the smoke vapor for great flavor. The grill set up is the easiest part. Simply lite the burners on only half the grill. Place wood chunks either directly on the heat shields located under the grill grate or in a smoker box placed on top of the grill grate of the lit burners. Allow to heat up for about 10 minutes. Then place the pan of cut zucchini on the unlit side of the grill and close the lid. Tasting Notes: You do have an option to slice your zucchini lengthwise into quarters and grill directly on the grate. Know this will produce stronger wood flavoring to the finished product and you will still need to cut the zucchini down into bite-size pieces. After the zucchini has cooked for about 30 minutes, add the diced tomato and jalapeno. 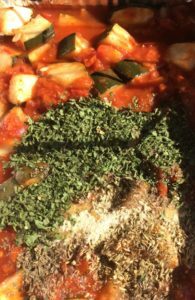 Let that cook for 15 minutes and then add the pasta sauce, basil, oregano, parsley and garlic powder. Tasting Notes: This can be a spicy dish so if you only like a mild kick add ¾ cup of ricotta cheese when the pasta sauce and herbs are added. All this made in one pan! 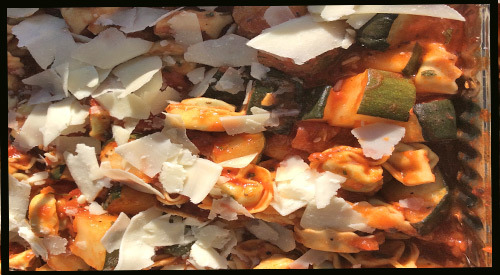 The final step to our grilled zucchini with tomato pepper ragout is to add the tortellini. You may wonder how tortellini will cook without any water. Essentially, you only need a little liquid with heat to produce enough steam to cook the tortellini. The best part is you won’t have any pasta that is soggy and unable to hold its form. After adding about 10 ounces of tortellini – mine happens to be filled with spinach – the ¼ cup of shaved asiago and parmesan cheese are added. Everything is mixed well and left on the grill until the tortellini are tender. That’s it! Everything completely made on the grill and absorbing the great wood flavor from our SmokinLicious® chunks. This is a great starter recipe that you can easily modify to fit your taste. 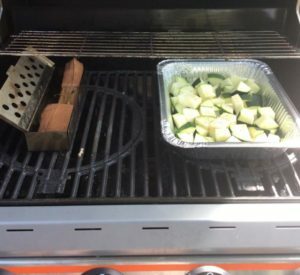 Now you need to try to Pan Cook Zucchini on the gas grill with wood! Dr. Smoke-pan cook zucchini on the gas grill for great flavoring.